Reflecting the spirit of the season, the Government has announced the lifting of restrictions on pilgrimages to Israel for Malaysians. With five more days to go before Christmas, Christians around the country have described the announcement as an “early Christmas gift”. PUTRAJAYA: Malaysia has relaxed restrictions for religious visits to Israel, lifting the quota on the number of pilgrims and allowing travel to anyone for up to 21 days at a time. According a letter issued by the Prime Minister's Office to the Christian Federation of Malaysia (CFM) on Nov 28, Christians can also, among others, visit Israel as many times as they want as well as travel anywhere, subject to approval from the authorities there. Previously, pilgrimages to Israel were limited to 700 Malaysians each year, with only 40 from one church and a stay of only up to 10 days at a time. 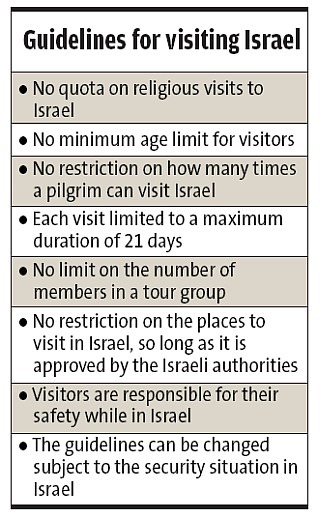 The pilgrims, who must be at least 18 years old, were also not allowed to visit Israel more than once in three years. CFM executive secretary Tan Kong Beng said the Home Ministry used to impose the yearly quota on the number of pilgrims to Israel, with which Malaysia has no diplomatic relations. “There are now no more quotas for those travelling for religious purposes to Israel. The decision came after a meeting with the Government in the middle of this year. 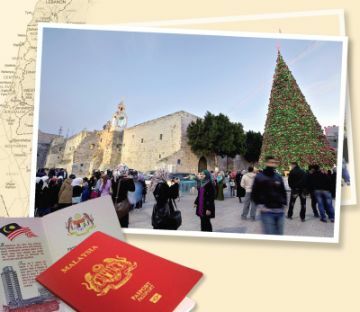 “This is part of a consultation process with the relevant agencies,” he told The Star adding that he expected more Christians to apply to go to Jerusalem for religious pilgrimages. He also refuted news reports that the relaxation of the restrictions, contained under an eight-point guideline in the letter, was carried out as part of a “concession” by the Government with the general election around the corner. “It was a result of a consultation, a part of a process in which the Prime Minister has engaged with religious groups in dialogues to discuss issues and matters of concern to the public,” said Tan. He said the guidelines were, however, dependent on the security situation in Israel, which was currently in a long, drawn-out conflict with Palestine. “As far as we understand, the Government will not allow us to visit if there is a security situation in Israel, which is fair,” said Tan. Datuk Seri Najib Tun Razak's political secretary Wong Nai Chee confirmed that the guidelines in the letter, which was addressed to CFM president Bishop Ng Moon Hing, were effective from Oct 30 this year. Israel is considered a place with many holy sites including Bethlehem, the birthplace of Jesus Christ, and Jerusalem for the 2.7 million Christians in the country, who make up 9.2% of the population. It is understood that a 10-day visit to Israel could cost between RM8,000 and RM12,000.